You can use these images in your teaching with a palliative care or geriatrics team on teaching rounds. What thoughts do they evoke? 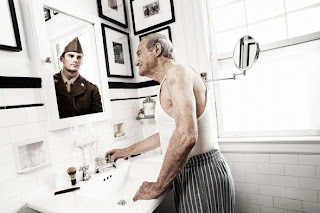 How do our patients see themselves? Who were they? Who are they now? The second is a self-authored obituary by Jane Catherine Lotter, age 60, of Seattle WA. You may note that at the bottom it states Jane took advantage of Washington state's Death with Dignity Act. I am not sharing this website as a proponent of the death with dignity movement - it is, in fact, a subject about which I am deeply ambivalent. And it's been something of a wedge issue in the palliative care community. No matter how you feel about this subject, we can all agree that Jane Lotter's obituary is truly remarkable, and captures the sense of peace and possibility at the end of life. This is common ground for all of us. I was given the gift of life, and now I have to give it back. This is hard. But I was a lucky woman, who led a lucky existence, and for this I am grateful. I first got sick in January 2010. When the cancer recurred last year and was terminal, I decided to be joyful about having had a full life, rather than sad about having to die. Amazingly, this outlook worked for me. (Well, you know, most of the time.) Meditation and the study of Buddhist philosophy also helped me accept what I could not change. At any rate, I am at peace. And on that upbeat note, I take my mortal leave of this rollicking, revolving world-this sun, that moon, that walk around Green Lake, that stroll through the Pike Place Market, the memory of a child's hand in mine. This is exactly the type of obituary I hate seeing in the newspaper and the kind I would never want written about me. Since she is a writer and had plenty of time on her hands she should be forgiven. I agree that the Death with Dignity provokes many questions and uncomfortable feelings. That said, this obit is a powerful testament to a well lived life. I am in fact curious why they chose to mention the vehicle of death this way? Maybe a last bit of advocacy?